Mormon Wookiee: #133: How to Get a Free Ancestry.com Account (for LDS Church Members). #133: How to Get a Free Ancestry.com Account (for LDS Church Members). In February of this year, I remember hearing an exciting announcement that the Church of Jesus Christ of Latter-Day Saints had entered into partnerships with ancestry.com, findmypast.com, and myheritage.com to provide free premium memberships for all members of the church. This is a pretty big deal since premium memberships to those sites range in the $200 - $400 range per year. I previously had a paid membership to ancestry.com, which in my opinion, is the greatest website in the world for genealogists/family historians. It literally has billions (with a b) of historical records scanned and indexed for easy searching. When I heard the announcement, I was very eager to cancel my current paid Ancestry membership and get started with a free membership instead (as well as new memberships to Findmypast and Myheritage). However, since February I haven't heard any updates about it. Well, today I decided to do some searching and found that it is really easy to get your free accounts. 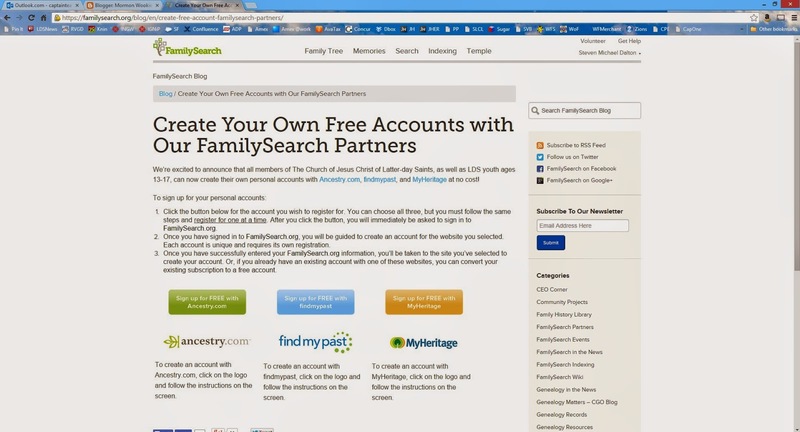 Simply go to familysearch.org/partneraccess and you can create a free account to each of the three websites! It takes a mere matter of minutes. Happy searching! You need to be a current member of the Mormon church in order to qualify. Keep in mind that many Mormon churches have a Family History Center in them that will allow you to use Ancestry.com for free.